Send in a crazy, fun photo of you and your fiancé and you could win a free engagement session! Whenever I have a free weekend, I love to get outside, explore and have some spontaneous fun! This past Saturday, Mark and I headed out to some parks we had never been to before. 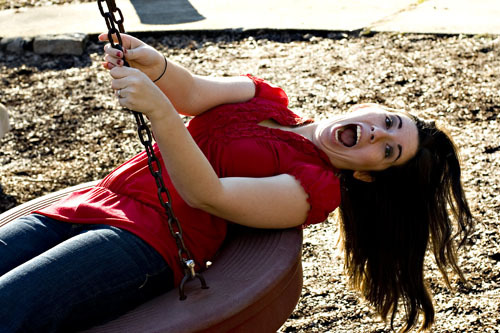 We had fun playing on the playground and watching all the dogs run around while snapping funny photos of each other. I love goofy photos, and it gave me an idea for a fun contest. This year for Valentine’s Day True Expression Photography is giving away a free engagement session and photo guestbook to one lucky couple. The contest is simple. Sent me a fun photo of you and your fiancé. I will post my favorite entries on my blog on Valentine’s Day and blog readers will vote on their favorite photo. Photos should be fun and creative and will be judged on how well they show your personalities- not on photographic quality. Entries must be received by February 10, 2009. Entries must be received by midnight EST on February 10, 2009.
how fun! I can't wait to see who the winner is! !